A member of the gregarious lily family but, unlike its flowery relations with their outward displays of ravishing color, this very plain-looking root is all about inner beauty. Garlic is the oldest cultivated plant in the world, and its hidden qualities have been recognized for longer than the written word. Five-thousand-year-old Sanskrit writings document employing garlic for medical use. The Chinese have been using it in medicines for over three thousand years. Some of the greatest names in history, such as Hippocrates, Aristotle, and Pliny, write about the therapeutic magic of garlic. Such was its mystic power that it was even believed to ward off vampires. Try doing that with a handful of pretty lilies. Garlic is an excellent source of vitamin B6, and a good source of selenium, manganese, and vitamin C. Minerals include calcium, phosphorous, iron, copper and potassium. Just 149 calories contains a surprising 6.4 grams of protein. Garlic inhibits bacterial growth and fungus. It also helps with an overgrowth of yeast in the body and is used in treating candida. Do not use odorless garlic pills. If they don't smell, your body can't tell. 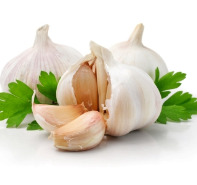 At the National Cancer Institute, research is showing great promise that garlic extract reduces the proliferation of cancer cells and attacks abnormal cells. A women’s health study in Iowa has found that women who consumed garlic just once a week had a 32 percent lower risk of contracting colon cancer. These are just a few examples of countless studies showing the curative power of garlic. Always start with juicing your garlic, pushing it through with an apple. By the time you are done juicing, any volatile oil residue will be cleaned out, avoiding that hint of garlic in your next batch of cantaloupe juice. Simply break off a clove or three and throw into the hopper. I have spent over twenty years juicing thousands of pounds of produce and tried just about ever juicer on the market. I can confidently say that our Juice Nut Top Pick Juicers are the very best in workmanship, warranty, juice yield and juice quality. I’m nuts about these juicers! The curative talents of garlic are at their peak when eaten raw, and even better when juiced. Unfortunately, so is the smell. A tip to reduce the bad breath effect without compromising quality is to wrap your cloves in a nest of greens like spinach, or better still, parsley, then throw into the juicer. The chlorophyll binds to the smell, so this important key to your radiant health won’t compromise your social networking. Garlic is available and affordable all year around. Look for firm, plump whole bulbs with no discoloration. Will keep on counter, unwrapped, for one to four weeks. Check to make sure cloves are firm, and remove any that have begun to soften. If turned color with mold, throw out. The first time I threw a clove of garlic into my juicer, I found the mildly biting taste an unpleasant addition to a veggie juice combination I had grown to love (carrot, apple, celery, red pepper, lemon, and spinach). But once I discovered the incredible attributes within this little clove, I was determined to get used to the added taste. It didn’t take long before I was tossing in three cloves, and today I cannot imagine my veggie juice without it. I have grown to love the taste. It was kind of like black olives or pickles. The first time I tried them I could not imagine ever liking the taste. Now they’re downright addictive. Unlike olives or pickles, it’s worth acquiring a taste for this magical little root, and hopefully your spouse will too. The The Juice Nut Guide To Juicing (eBook) is available to purchase now! Entertaining yet very educational read. Thank you! Garlic everyday for me. Why not? Wonderful, I've just made one of my usual juices (carrots, parsley, ginger and coriander leaves) and decided to add a clove of garlic in it because I can't eat it otherwise (I love garlic!) as hubby doesn't like it since he's not eating garlic. Now he can't feel the smell on my breath at all and when I read on your post that the chlorophyll from parsley binds to the smell, I knew I have a winner of a juice. Yum! THANK YOU FOR PROMOTING GARLIC. I agree! We have at least 4 cloves of garlic in our juice every morning. Hi! I buy a jar of peeled garlic, empty 1/2 out, and fill the container with water. Now pour it into sauce pan & bring to a boil. Add red pepper flakes (about a spoon full), and a 1/2 cup of sugar. Bring to a boil & mix, then shut off heat and let set a few hours. Pour back into the jar all ingredients, and store with lid on for 3-4 days. Now you are ready for a great raw treat of sweet-hot garlic. I eat about 3-6 cloves a day. My recent find. Turn garlic into a juice in the blender (about 12 heads), and add a 1/2 cup water. Strain through a wash cloth, with a funnel, into a bottle. Add 6 tea spoons to 1 gallon sprayer water to kill Mosquito's & repel them for up to a month. You can spray on your foliage and under it, around lights, etc. I haven't noticed any snails either.